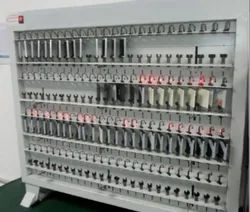 Our range of products include ld-100 battery charging cabinet. 1, Can charge the phone battery directly. 2, Constant voltage charging DC 4.2V. 3, Each charging port controlled individually . 4, LED display the charging status. 5, All mobile phone battery can be charged. 6, Universal clamps, length, width, can be adjusted. 7, Easy to operate. When charging battery packs connected to the positive charge counter the positive (red) a negative electrode connected to the charging cabinet (black). 2. Installed rechargeable batteries on the battery holder,make it contact closely through ajusting the screws (Note: the top of Battery clamp that red needle is positive, black is negative), positive and negative must not be able to be reversed otherwise it will damage the board of the Charging port. 4. The indicator will light up when it charges.If not,it indicates that the battery is fully charged or in poor contacted. Note: According to different batteries,the charging current is setted about 500-1000mA ,generally about 1 hour.